Common wisdom is that you shouldn't judge a book by its cover. But book publishers bet on book covers all the time. Covers and titles. Once I heard an editor--or was it an author?--offer this suggestion for confirming a working book title's merit. Stop in at your neighborhood coffee shop and tell the barista as he's foaming the milk for your latté that you're writing a book and here's the title. Go back the next day. Hopefully the same barista is there. Order again and ask him to tell you the title of the book you mentioned to him yesterday. If he can remember it, the title gets a couple points in its favor. If not, discard it and try again with something else. 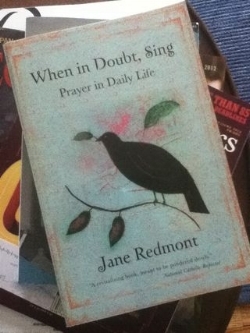 Recently I was at the Festival of Faith and Writing, where tables of books abound, and this book pictured here, When in Doubt, Sing: Prayer in Daily Life, caught my eye. It was the first day of the conference and I hadn't yet taken out my wallet or started forming my to-buy list. By the end of the next day, however, I couldn't get this book--its title or its cover--out of my mind, so I went back to the table and bought it without knowing anything about it or the author, Jane Redmont, other than what you can read on the cover and bio page. Kudos to the book's designer, Katherine Robinson Coleman. The title of this book is apparently drawn from one of the chapter titles, and what a great title it is. A word of wisdom in and of itself: when in doubt, sing. It's like a getting a freebie prize along with your purchase.